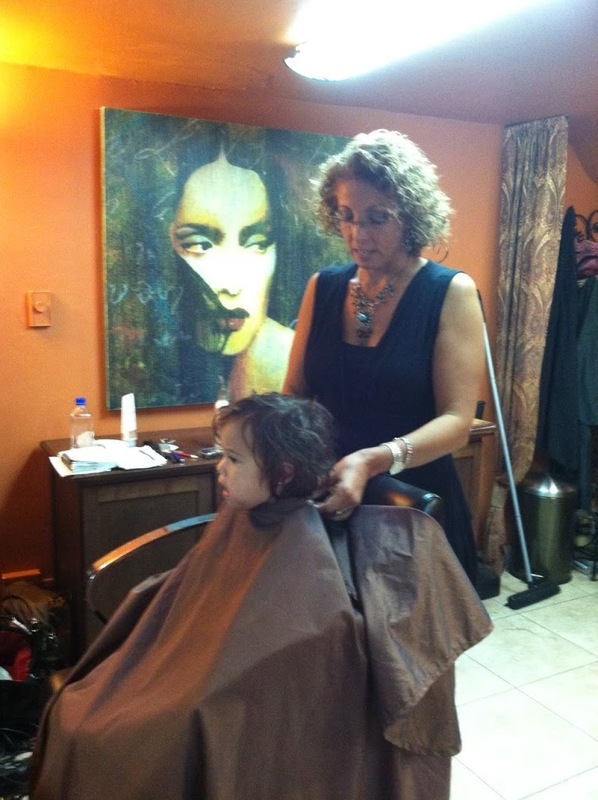 After receiving the best haircut of my curly girl life, by the lovely and talented Vardit, I was longing to get my kids the same quality of cut. Unfortunately in Park Slope, haircuts for kids cost an arm and a leg. I was lamenting about my haircut woes on Facebook, when my Fairy God Mother, Kyle came to the rescue, she reminded me that Vardit cuts children’s hair, and a reasonable price too. 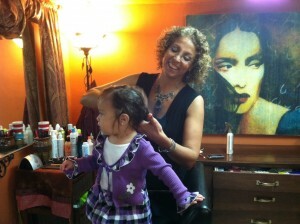 So we headed uptown to 102nd Street to visit Vardit for Samara’s first haircut ever! I tried to wait as long as possible to cut her hair, but she’s a curly girl too, and she needed a good trim and shaping. She reminded me that if I didn’t want my hair to look frizzy, I needed to wet my hair and condition it daily, and only shampoo once every three days or so. 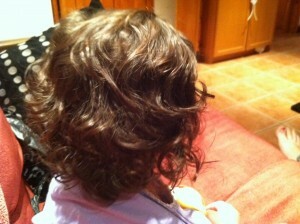 But the most important thing was to use the right product, for me she recommended Curls Rock. 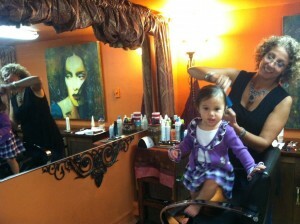 I was nervous about how Samara would react to her first haircut ever. Vardit put the cape on her, and I thought, oh this might not be too bad. But then, she ripped the cape off and became restless. She stood up in the chair. Fortunately, since Vardit has three girls, she wasn’t phased at all. She followed Samara’s natural active toddler movements and managed to calm me down as well in the process. And guess what? 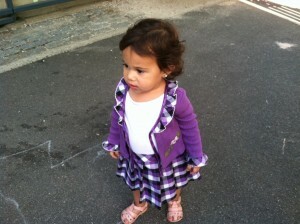 Samara got a haircut without the assistance of Toy Story or Yo Gabba Gabba. She didn’t need to watch anything to distract her; that’s how talented Vardit is. I thought about it, and usually, when he’s gotten haircuts in the past, I realized that he’s been watching some sort of movie or TV show. “He’s usually distracted.” I said “I know!” I exclaimed and with that I busted out my IPhone and quickly found my fingers to YouTube and then to an episode of The Smurfs from the 1980s. Once Ari was watching the Smurfs he did not care what was happening around him. 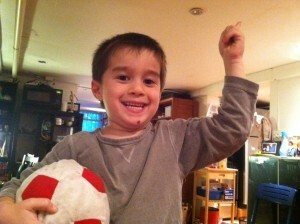 And Vardit gave him an awesome haircut. Now I’m sure if you’re anything like me, you’re a curious person and you’re dying to see the final product. So…here you go! 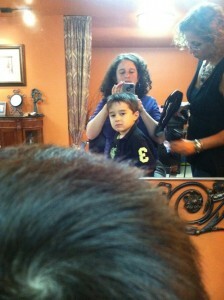 Thank you Vardit, for giving my kids awesome haircuts, and for being so patient and loving with them!